Contains letter to PM Whitlam by parliamentarians (including McIntosh) in August 1975; 9-page report by Arthur Gietzelt and Ken Fry of visit to Timor in September 1975. Also a Fretilin media statement (13 Sep 1975) on the situation following the end of the fighting, appealing for humanitarian aid; and Fretilin Central Committee press statement (16 Sep 1975) listing internal and external policies adopted that day. 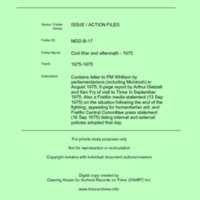 “Civil War and aftermath - 1975 [MGD B17],” CHART DIGITAL, accessed April 18, 2019, http://chart-digital.info/items/show/644.